The key to understanding architecture is to examine the pieces—to look at the design and construction and de-construct. We can do this with the prize-winning architect Frank Gehry, a man who is too often despised and admired all in the same breath. Gehry embraces the unexpected in ways that justifiably has labeled him a deconstructivist architect. To understand Gehry's architecture, we can deconstruct Gehry, beginning with the house he remodeled for his family. Architects rarely find stardom overnight, and this Pritzker Laureate is no exception. The Southern California-based architect was well into his 60s before the critical successes of the Weisman Art Museum and Spain's Guggenheim Bilbao. Gehry was in his 70s when the Walt Disney Concert Hall opened, burning his signature metal façades into our consciousnesses. Gehry's success with those high-profile polished public buildings may not have occurred without his experimentation on a modest bungalow in Santa Monica. The now-famous Gehry House is the story of a middle-aged architect who forever changed his notoriety—and his neighborhood—by remodeling an old house, adding a new kitchen and dining room, and doing it all in his own way. Design—How did Gehry experiment with design? Materials—Why did Gehry use unconventional materials? Aesthetics—What is Gehry's sense of Beauty and Harmony? Process—Does Gehry make a plan or just embrace chaos?
" I told Berta I didn't have time to find a house, and because we liked Santa Monica, she got a realtor there. The realtor found this pink bungalow on a corner which, at the time, was the only two-story house in the neighborhood. We could have moved in as it was. The upstairs part was large enough for our bedroom and a room for the baby. But it needed a new kitchen and the dining room was tiny—a little closet." " I started working on its design and got excited about the idea of building a new house around the old house. Nobody realizes I had done the same thing a year before in Hollywood, when the office was out of work. We figured we could both create work and make money. We had all chipped in and bought the house, then remodeled it. We built a new house around the old house, and the new house was in the same language as the old house. I liked that idea and I hadn't really explored it enough, so when I got this house, I decided to take that idea further." " Two-thirds of a building is the back end, the sides. That's what they're living with, and they put this little façade on. You can see it here. You can see it everywhere. You can see it in the Renaissance. It's like the grande dame going to the ball with her Oscar de la Renta outfit, or whatever, with a hair curler in back, which she forgot to take out. You wonder why they don't see it, but they don't." Gehry's interior design—a glass-enclosed rear addition with a new kitchen and a new dining room—was as unexpected as the exterior façade. Within a framework of skylights and glass walls, traditional interior utilities (kitchen cabinets, dining table) seemed out of place within a shell of modern art. The inappropriate juxtaposition of seemingly unrelated details and elements became an aspect of deconstructivism—an architecture of fragments in unexpected arrangements, like an abstract painting. The design was controlled chaos. Although not a new concept in the world of modern art—consider the use of angular, fragmented images in a Pablo Picasso painting—it was an experimental way of designing architecture. When Frank Gehry added a new kitchen to his pink bungalow, he placed the 1950s interior design within a 1978 modern art addition. Sure, there's natural lighting, but the skylights are irregular—some of the windows are traditional and linear and some are geometrically jagged, misshaped as windows in an expressionist painting.
" From the beginning of my adult life, I always related more to artists than to architects....When I finished architecture school, I liked Kahn and Corbusier and other architects, but I still felt there was something more that the artists were doing. They were pushing into a visual language, and I thought that if a visual language could apply to art, which it obviously could, it could also apply to architecture." Gehry's design was influenced by art and so were his construction materials. He saw artists using bricks and calling it art. Gehry himself experimented with corrugated cardboard furniture in the early 1970s, finding artistic success with a line called Easy Edges. In the mid-1970s, Gehry continued his experimentation, even using asphalt for the kitchen floor. This "raw" look was an an experiment with the unexpected in residential architecture.
" My house couldn't be built anywhere but California, because it is single glazed and I was experimenting with materials that are used here. It's also not an expensive construction technique. I was using it to learn the craft, to try and figure out how to use that." Materials: Stucco? Stone? Brick? What would you choose for exterior siding options? To remodel his own home in 1978, a middle-aged Frank Gehry borrowed money from friends and limited costs by using industrial materials, such as corrugated metal, raw plywood, and chain link fencing, which he used as one would enclose a tennis court, a playground, or a batting cage. Architecture was his sport, and Gehry could play by his own rules with his own house.
" I was very interested in the direct link between intuition and product. If you look at a Rembrandt painting, it feels like he just painted it, and I was looking for that immediacy in architecture. There were tract houses being built all over the place, and everybody, including me, said they looked better raw. So I started playing with that aesthetic." Later in his career, Gehry's experimentation would result in the now-famous stainless steel and titanium façades of buildings like the Disney Concert Hall and Guggenheim Bilbao. Similar to the kitchen design, the dining room of the 1978 Gehry House combined a traditional table setting within a modern art container. Architect Frank Gehry was experimenting with aesthetics.
" Remember that on the first iteration of the house, I didn't have a lot of money to play with. It was an old house, built in 1904, then moved in the 1920s from Ocean Avenue to its present site in Santa Monica. I couldn't afford to fix everything, and I was trying to use the strength of the original house, so that when the house was finished, its real artistic value was that you didn't know what was intentional and what wasn't. You couldn't tell. It took all those clues away, and in my opinion that was the strength of the house. That's what made it mysterious to people and exciting." Aesthetic: A sense of what is beautiful is said to be in the eye of the beholder. Architect Frank Gehry experimented with unexpected designs and played with the rawness of materials to create his own beauty and harmony. 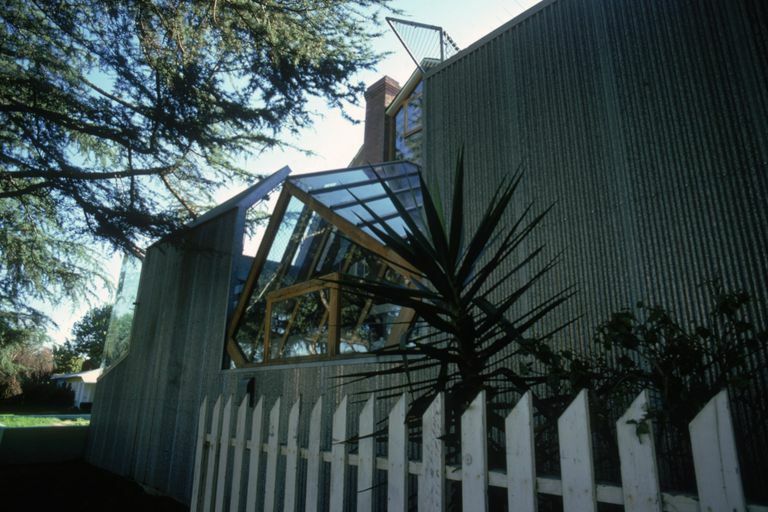 In 1978, the Gehry House in Santa Monica became his laboratory for experimentation with aesthetics.
" It was the most freedom I'd had at that point. I could express myself more directly, without editing...There was also something about the blurring of the edges between past and present that worked." Non-traditional residential building materials contrasted with traditional neighborhood designs—the wooden picket fence played counterpoint to the corrugated metal and now infamous chain link walls. The colorful concrete wall became a foundation not for the house structure, but for the front lawn, literally and symbolically connecting the industrial chain link with the traditional white picket fencing. The house, which would come to be called an example of modern deconstructivist architecture, took on the fragmented look of an abstract painting. The art world influenced Gehry—the fragmentation of his architectural design suggests the work of the painter Marcel Duchamp. Like an artist, Gehry experimented with juxtaposition—he placed picket fences next to chain link, walls within walls, and created boundaries with no boundary. Gehry was free to blur traditional lines in unexpected ways. He sharpened what we see by contrast, like a character's foil in literature. As the new house enveloped the old house, new and old blurred to become one house. Gehry's experimental approach frustrated the public. They wondered which decisions were intentional and which were building errors. Some critics called Gehry contrary, arrogant, and sloppy. Others called his work ground-breaking. Frank Gehry seemed to find beauty not only in raw materials and exposed design, but also in the mystery of intention. The challenge for Gehry was to visualize mystery. "No matter what you build, after you solve all the issues of function and budget and so on, you bring to it your language, your signature of some sort, and I think that's important. The most important thing is to be yourself, because as soon as you try to be somebody else, you tend to denigrate the work and it's not as powerful or as strong." " ...there was this row of bricks. I followed the bricks to a wall where a sign described the artwork as 137 firebricks by the artist Carl Andre. At that time I was doing the chain-link stuff, and I had this fantasy that you could call in architecture. You could call the chain-link guys and you could give them coordinates and they could build a structure....I had to meet this guy, Carl Andre. Then maybe a few weeks later, I did meet him and I told him how I had just seen his piece at the museum and I was so fascinated by it because all he had to do was call it in. I went on and on about how wonderful it was that he'd done that, and then he looked at me like I was a madman....He pulled out a pad of paper and started drawing firebrick, firebrick, firebrick on the paper....That's when I realized it was painterly. It kind of put me in my place...."
Gehry has always been an experimenter, even with improving his process. These days Gehry uses computer software originally developed to design automobiles and aircraft—Computer-Aided Three-dimensional Interactive Application or CATIA. Computers can create 3-D models with detailed specifications for complicated designs. Architectural design is an iterative process, made faster with computer programs, but change comes through experimentation—not just one sketch and not just one model. Gehry Technologies has become a sideline business to his 1962 architectural practice. The story of the Gehry House, the architect's own residence, is the simple story of a remodeling job. 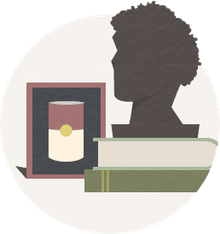 It is also the story of experimentation with design, solidification of an architect's vision, and, ultimately, the pathway to professional success and personal satisfaction. The Gehry House would become one of the first examples of what became known as deconstructivism, an architecture of fragmentation and chaos. To which we say this: When an architect moves next door to you, take note!